Wing span: 1 - 1 3/16 inches (2.5 - 3.1 cm). 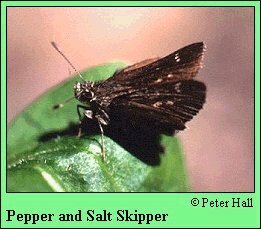 Identification: Upperside is reddish brown with pale spots; male forewing has a black stigma. Underside of hindwing is light gray-green with a pale postmedian band. Caterpillar hosts: Bluegrass (Poa pratensis), Indian grass (Sorghastrum nutans and S. secundum), and Indian woodoats grass (Chasmanthium latifolia). Adult food: Nectar from flowers including viburnum and blackberry. Habitat: Near streams in forest glades and edges. Range: Nova Scotia and Maine west to southern Manitoba; south to Georgia, north Florida, and southeastern Texas. Mostly absent from the coastal plain.